In accounting and finance, a profit margin is a measure of a company’s earnings (or profits) relative to its revenueSales RevenueSales revenue is the starting point of the income statement. Sales or revenue is the money earned from the company providing its goods or services, income. The three main profit margin metrics are gross profit margin (total revenue minus cost of goods sold (COGS) ), operating profit margin (revenue minus COGS and operating expenses), and net profit margin (revenue minus all expenses, including interest and taxes). This guide will cover formulas and examples, and even provide an Excel template you can use to calculate the numbers on your own. When assessing the profitability of a company, there are three primary margin ratios to consider: gross, operating, and net. Below is a breakdown of each profit margin formula. As you can see in the above example, the difference between gross vs netGross vs NetGross means the total or whole amount of something, whereas net means what remains from the whole after certain deductions are made. This guide will compare gross vs net in a business financial context. For example, a company with revenues of $10 million and expenses of $8 million reports a gross income of $10 million is quite large. In 2018, the gross margin is 62%, the sum of $50,907 divided by $82,108. The net margin, by contrast, is only 14.8%, the sum of $12,124 of net income divided by $82,108 in revenue. Let’s consider an example and use the formulas displayed above. XYZ Company is in the online retail business and sells custom printed t-shirts. The revenue from selling shirts in 2018 is $700k, the cost of goods soldCost of Goods Sold (COGS)Cost of Goods Sold (COGS) measures the “direct cost” incurred in the production of any goods or services. It includes material cost, direct labor cost, and direct factory overheads, and is directly proportional to revenue. As revenue increases, more resources are required to produce the goods or service. COGS is often (the direct cost of producing the shirts) is $200k, and all other operating expenses (such as selling, general, administrative (SG&ASG&ASG&A includes all non-production expenses incurred by a company in any given period. This includes expenses such as rent, advertising, marketing, accounting, litigation, travel, meals, management salaries, bonuses, and more. On occasion, it may also include depreciation expense), interestInterest ExpenseInterest expense arises out of a company that finances through debt or capital leases. Interest is found in the income statement, but can also be calculated through the debt schedule. The schedule should outline all the major pieces of debt a company has on its balance sheet, and calculate interest by multiplying the and taxes) are $400k. Calculate the gross and net profit margins for XYZ Company in 2018. Gross margin is equal to $500k of gross profit divided by $700k of revenue, which equals 71.4%. Net margin is $100k of net income divided by $700k of revenue, which equals 14.3%. You may be asking yourself, “what is a good profit margin?” A good margin will vary considerably by industry, but as a general rule of thumb, a 10% net profit margin is considered average, a 20% margin is considered high (or “good”), and a 5% margin is low. Again, these guidelines vary widely by industry and company size, and can be impacted by a variety of other factors. Below is a screenshot of CFI’s profit margin Excel calculator. 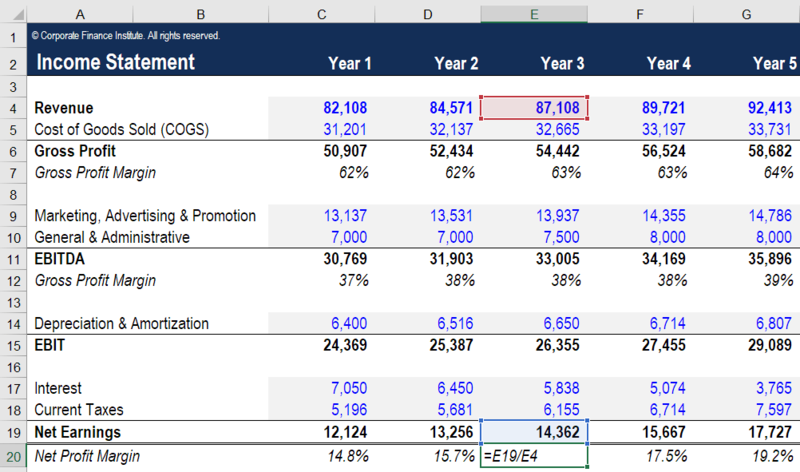 As you can see from the image, the Excel file allows you to input various assumptions over a five year period. All cells with blue font and light grey shading can be used to enter your own numbers. All cells with black font are formulas and don’t need to be edited. As you can see from the screenshot, if you enter a company’s revenue, cost of goods sold, and other operating expenses you will automatically get margins for Gross Profit, EBITDAEBITDAEBITDA or Earnings Before Interest, Tax, Depreciation, Amortization is a company's profits before any of these net deductions are made. EBITDA focuses on the operating decisions of a business because it looks at the business’ profitability from core operations before the impact of capital structure. Formula, examples, and Net Profit. EBIT (earnings before interest and taxes) is the same thing as Operating Profit; EBITDA is slightly more refined, closer to Net Profit. To edit the Excel calculator, you can insert or delete rows as necessary, based on the information you have. For example, to add more expense line items such as “Salaries and Wages”, simply insert a row for each one and add the numbers as appropriate. Whan analyzing a company a good analyst will look at a wide range of ratios, financial metrics, and other measures of performance. Below is a list of commonly used performance metrics that analysts often consider in order to compile a complete and thorough analysis of a business. Which financial metrics are most important will vary by company and industry. For example, ROE may be a key metric in determining the performance of Company A, while the most helpful metric in analyzing Company B might be revenue growth rate. Key metrics are often ones where a company’s performance – as indicated by the metric – is substantially different (whether better or worse) from that of most of its competitors. By considering the above factors along with the profitability margins covered in this article, you’ll be well on your way to performing complete financial analyses.